Nnamdi Kanu has been spotted at the historic Nri forest offering special prayers asking God for divine intervention. The leader of the Indigenous People of Biafra, IPOB, Mazi Nnamdi Kanu has said he will resist any plan to Islamize any part of Igbo land while praying at the historic Nri forest in Anambra state. The IPOB leader was welcomed by a huge crowd of Biafra activists when he visited Nri, the ancestral home of Ndigbo. At Nri, Kanu, who was accompanied by his wife, visited the historic “Ohianwehi” revered as “forest of life” by Igbo tradition. It is believed that it was where the first burnt offering was scarified by the Jewish Igbo ancestors when they migrated from Israel about 300 years ago. Kanu and his entourage prayed at the entrance of the “forest of life” which according to stories nobody had entered into over 300 years ago. While addressing the crowd of Biafra supporters that gathered at Nri community square to catch a glimpse of him, the IPOB leader told them that the alleged plot to Islamise Nigeria was real but would be resisted. “The Islamisation plot is real but they won’t succeed in my life time. No, never; not when I am alive. “The struggle for Biafra which I proudly lead is not a secessionist aspiration of NdiIgbo only as some erroneously think. 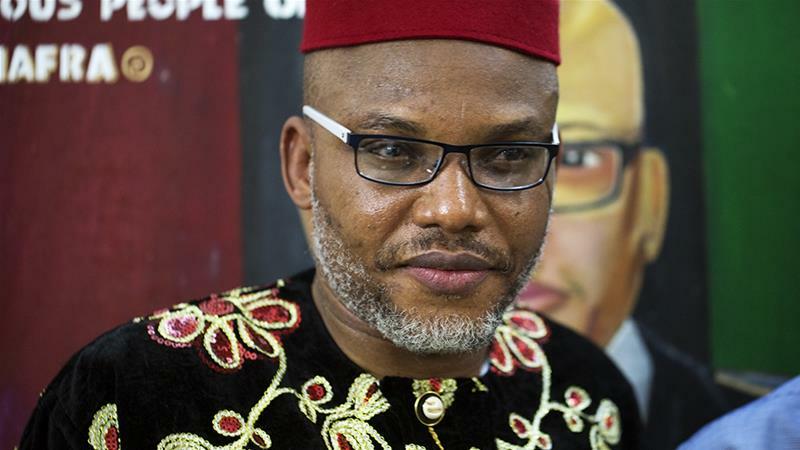 Biafra is not just a living agitation but a fight for the survival of Christians in Nigeria against the entrenched threats of radical Islamic fundamentalists and their political collaborators within and outside Nigeria”, Kanu said. The IPOB leader assured Christians in the North that he would not abandon them after actualizing Biafra, but would also defend them against any imposition of religious faith against their will. According to him, Biafra would come as a surprise to many if the people cooperated with the blue-print of the leaders of the agitation. “If you want Biafra to be restored, sit at home on November 18. I am not saying you should fight or take up arms; rather you will see Biafra emerging like the rising sun very soon”, Kanu urged his listeners. He expressed joy that the people of the Middle Belt had realized their mistake in taking sides with the Federal troops against Biafrans during the civil war, saying “that the agitation for Biafra is a true fight for freedom, and they are now supporting the move”. Kanu also attacked former British Prime Minister, Mr. Tony Blair over his recent visit to Governor Mallam Nasiru El- Rufai of Kaduna State, accusing him of lending support to the North to perpetuate their dominance of the Nigeria political space to the detriment of the South. Kanu and his entourage were also blessed by the holder of “Offo”, the kingmaker of Nri ancient kingdom, Chief Shedrack Mbanefo, who assured him of the readiness of the people to support him in the struggles for Biafra restoration.